At first glance, a drawing by Susan Logoreci might look chaotic and disorderly, but upon closer examination it is structured and functional. It is a direct reflection of the built environment. There are traces of grid-iron patterns, homogenized suburbia, high density zones, dysfunctional Situationist maps, and others have junctures of clash and duality. No two works are alike and the execution is done in an expressionist tradition - which is to convey the emotional experience through distortion rather than the physical reality. Moreover, often white layers of blankness - sometimes circular and figurative, other times horizontal and representational - convey abstract visual perception. Some pieces have a complete duality of sunshine and noir. On one end the image is dotted with illuminating sun that brings colorful impressions and warm tranquility, and provides the backdrop for peaceful simply living. On the other end a blanket of shadow invades the cityscape with something darker than just night. It is no man's land and a perpetual spring simultaneously; dark progressivism. 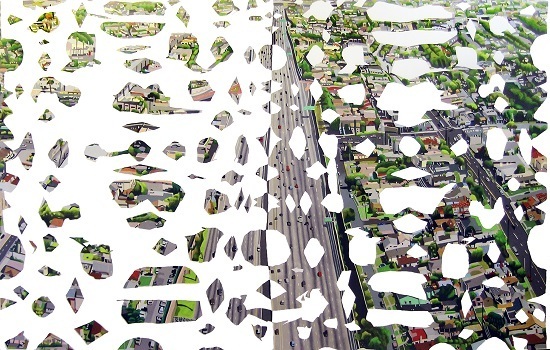 Susan Logoreci's work can be found in numerous places throughout Los Angeles as public commissions. 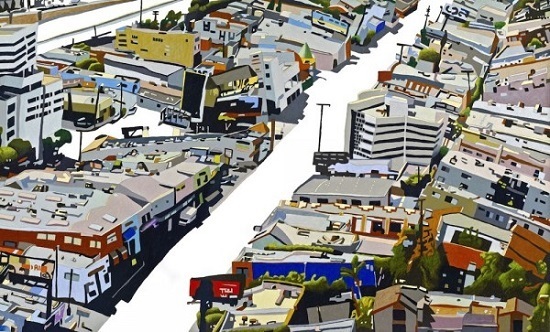 From the LAX airport, temporary piece now removed, to the Sepulveda station on the Expo Line, to the City National Bank Tower in Downtown Los Angeles, her bold urban landscapes are a narrative of the "other" Los Angeles, and the Los Angeles of booster campaigns simultaneously. Try as anyone might, they cannot be separated. Logoreci's perspective is directly informed by aerial views, since she charters helicopters for day and night flights to survey the city from a place that is hardly ever experienced. Drawings are then rendered from photographs taken from above, which doesn't always transfer over smoothly. It is in this transference that the white abstract spaces heighten and frame pockets of unseen places. Her drawings are as much about place and space, as about color and metaphor. In the artist's own words, "It's a metaphor for the city being paper-thin. It's this amazing project but it's also very fragile."